As part of his team's “Learn C-Pound” project at the office, KK decided to write a good, old-fashioned rock-paper-scissors server. Bots from around the network would log in and fight one another, 1000 rounds to the death; after several rounds, a winner would be declared. I suppose there are two ways to get programmers excited to do something: give them a good, useful, open-source tool that they can adapt to their needs (hence the success of the open-source movement); alternately, put them in a code-off, each against the other. The Homestead RPS Tourney definitely appealed to the latter. The rules were simple: don't directly implement Iocaine Powder, the current world-champion of roshambo. Although a bot using a “always throw random” strategy would be allowed, since everyone would know it was your bot there was a good chance you would receive an IRL beatdown (since a random player not only screws up everyone else's learning algorithms, but also indicates that that must've been your end goal). Naturally, there are a potentially-infinite (restricted, in this case, due to the facts that the tourney was only 1000 rounds long and that knowledge is limited to the game state (and random is a specific strategy)) number of strategies to follow here. In some sense, each player could pick some definite strategy such as above, and the tourney would determine which was best suited to beat the others. However, there's not much that's instructive about a bot which always throws rock beating a bot which always throws scissors. So what can make this competition algorithmically interesting? If the programs are instead designed to learn each others' strategies and beat those — rather than following a fixed set of rules — then the competition becomes about machine learning techniques, and not about rock-paper-scissors. Moreover, any appropriate piece of artificial intelligence should be able to trounce one of the aforementioned fixed strategies (a principle which was brought to bear during th competition). There are several different methods of looking at this problem, but I chose to look at it as a task in pattern-matching. That is, if we can find that the opponent's behavior follows some known patterns, then we can easily beat it; there is a lot more depth which could be layered onto this method, but any reasonable bot needs to keep a measure of relative behaviors and responses. In this case, if we know that R was thrown two prior, we're unsure what the next throw will be. However, if we know the previous throw was P, as well, then we fully expect the next throw to be P. Thus we can think of this as a refining tree. With this ability, we can take any previous event sequence of length and make a supposedly-optimal decision of what our subsequent throw should be. Rock on. Of course, there are some problems with this method. Besides it susceptibility to randomness (which all learning bots should have as a weakness), there is the distinct possibility that the bot will find itself in unknown territory, given the relative uniqueness of chains past a certain length. To combat this issue, the program maintains chains of multiple depths, each of which votes to determine the overall expected opponent play. This method, however, suffers its own risks. Let's assume we've just seen PR, and have the history above in mind. 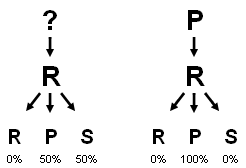 The first-level knowledge of merely R will force the bot to choose either P or S; if the bot chooses S, the final vote will be a stalemate and a random choice will ensue. Of course, this is not desireable behavior, since the best next choice is P.
Notice that the denominator is largest when the number of subsequent appearances of R, P, and S are similar in magnitude; when one blows the others away, the denominator will be significantly smaller and thus the overall weighting of the vote will be higher. Since the numerator is equal to the number of times we've seen this history, we see that this function upweights more common histories to normalize their weight — to a certain extent — with less common histories. Thus certainty is truly measured. With this weighting applied to the empirical probabilities, we have the basis for our comparative metric. Note that this weighting is possibly unnecessary, but performed quite well. In the end, we add up the evident probabilities, multiplied by their respective weights, and select the maximizing throw to be the opponent's next (the one we will beat). There is some room here for second- and third-guessing logic, but that went reasonably unexplored in this iteration. By and large, this is the algorithm's most significant hole. Although it would be possible to have the algorithm measure pure game-state, the probable sparsity of this measurement makes it less than ideal (although it can be used, so long as some adjunct measures are in place). For this reason, two chain histories were constructed: one measuring the opponent's throw in relation to its previous throws, and the other measuring the opponent's throw in relation to our bot's previous throws (of course, a full-state chain could derive these, but it comes to the classic time/space tradeoff). Moreover, the algorithm was implemented in Lolcode — specifically, the YALI dialect (yes, I could've done better than homebrew) — performance on a 10-deep chain was bad enough. Given a model and a history, returns the most likely next throw. IZ base LIEK history_length O RLY? There is an outer function to compile results, and to handle the whole “equal probability” thing. But this is the meat of the chain program. Thing one, I will not be programming in Lolcode again. It was cool for the effort, but now I can officially move on. Fair enough, the algorithm was almost explicitly engineered to handle those cases. Against other learning machines? ROFLBOT fared reasonably well against a variety of other strategies (none of which I remember offhand), and ended up coming in second — a victory for Lolcode users the world 'round. The demolishing bot used a depth of ~500, and was quite willing to throw random if it didn't have knowledge to within a certain threshhold (but honorably so). Second place. Not bad. Maybe next time. Go ahead, download ROFLBOT, you know you want to.